Councillors are campaigning for Tesco to open a supermarket in their town in the hope it attracts more shoppers. While the retail giant has faced opposition to new stores in other areas, Pontarddulais Town Council is backing Tesco's efforts to move in. Members have called for a show of support when Swansea Council planners visit the proposed site next week. Councillor and butcher John Mathias said a supermarket may persuade more people to shop locally. In recent years Tesco has faced opposition to its plans to open or expand stores in Carmarthen, Newtown, Ruthin and Lampeter. Opponents claimed new stores would hit independent traders. But Pontarddulais mayor Gail Bateman said: "There were councillors for and against it, but the majority fully support Tesco coming there." 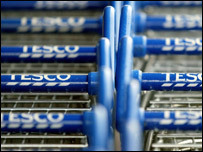 Tesco wants to build a 4,500 sq metre store on a derelict site off Station Road which it says will create 280 jobs. Swansea's planning committee will make a site visit on Wednesday before ruling on the application the following day. Mr Mathias said he felt traders in Pontarddulais had nothing to fear from a new store. "I think I'm safe in saying that the feeling in the village is in favour of Tesco," he added. "Many people leave to do their shopping in Llanelli or Fforestfach - if there is a Tesco these people will shop in their own town. "As a butcher if 10,000 go to Tesco in any one week and 100 of them choose to come to my shop for sausages then I will be happy. "I already have my regular customers - they are loyal - so it may bring a few more as well."